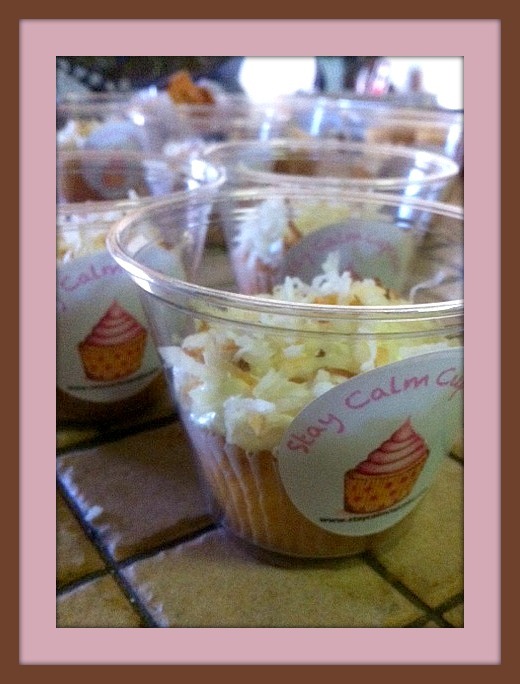 stay calm cupcake | Stay Calm, Have A Cupcake! This past weekend, I participated in the Food Blogger Bake Sale, supporting Share our Strenth, an organization fighting childhood hunger. It was such an inspiring event to be a part of! Not only did I meet some of Orlando’s finest food bloggers, I was able to take part in raising over $1,400 for a charity that is helping feed so many hungry children. For the bake sale, I made Strawberry Lemonade Cupcakes, Cookies and Cream Cupcakes, and Toasted Coconut Cupcakes! 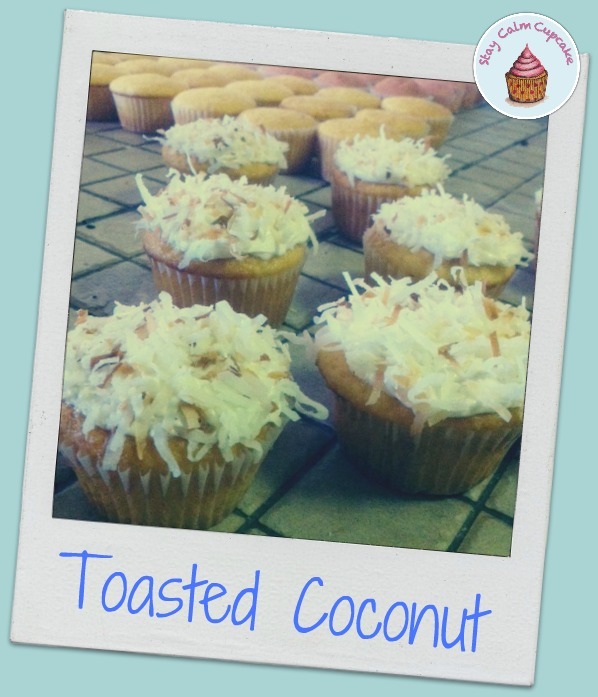 I was thrilled that my cupcakes were a hit with the customers! The photo above shows the whole group of bloggers who participated in the bake sale. Please go check out their blogs – they all have incredible photography, recipe, and restaurant reviews. 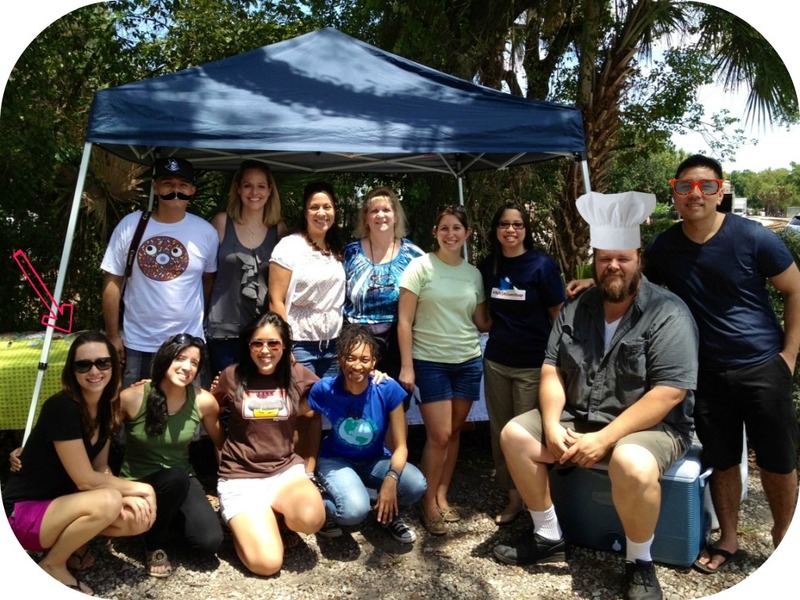 Back row: Julius from Droolius, Angie from Eclectic Recipes, Wanda from My Sweet Zepol, Robin from Simply Southern Baking, Katie from Katie’s Cucina, Julie from The Little Kitchen, Chris from Eat Local Orlando, Ricky from Tasty Chomps. Front row: ME!! , Marilyn from Forkful, Pearleen from Mega Yummo and Jacqueline from BeyondNFinity. 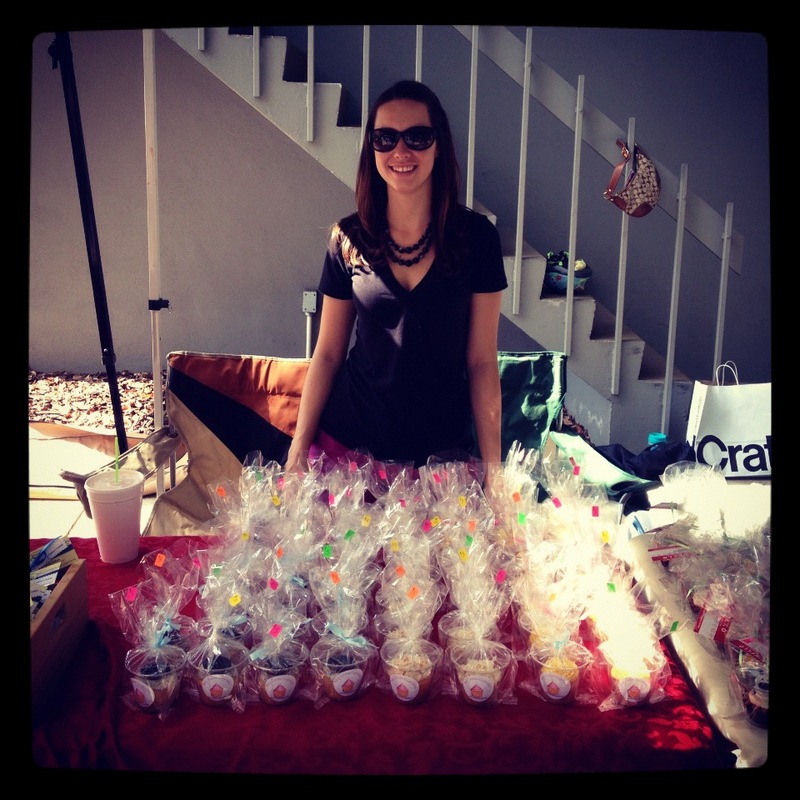 At the bakesale, getting ready for customers! Hope everyone is having a fabulous week. 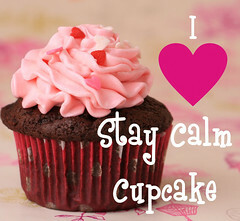 Stay tuned for more recipes and some updates from my advetures in Cupcake Wars casting for Season 7! St. Patrick’s Day is right around the corner, and what better way to celebrate than with some mint chocolate chip cupcakes! This recipe is a classic and the minty green frosting makes its perfectly festive for an Irish holiday. Mix on medium high for another 3-4 minutes. I like to decorate my cupcakes with mini semi-sweet chocolate chips. It’s also a nice touch to bake them in some festive cupcake liners. 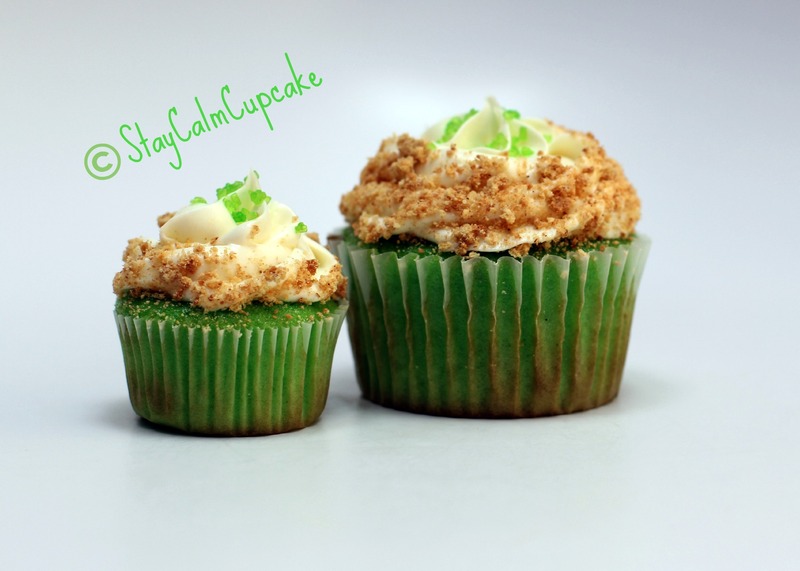 There you have it, an easy and delicious way to celebrate the luck of the Irish! Can you believe we are already gearing up for St. Patrick’s day?! I can’t. But I can say I am so excited to announce a new giveaway. 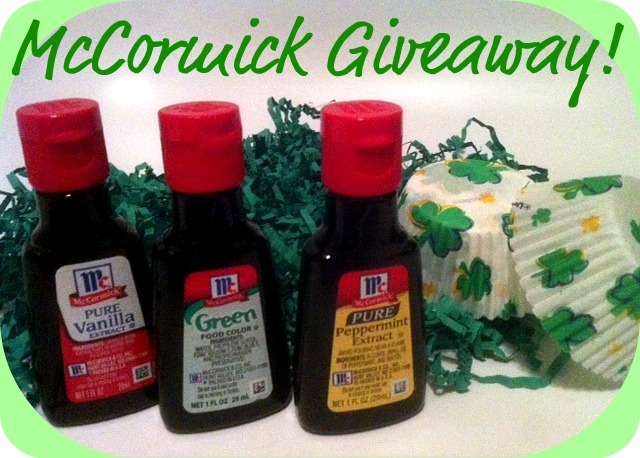 A McCormick Giveaway! Last October, McCormick was kind enough to send me and 2 of my readers a fun Halloween kit, full of baking supplies. It was such a fun giveaway and the box was filled with so many great baking items. I just couldn’t resist another opportunity to partner with McCormick again! 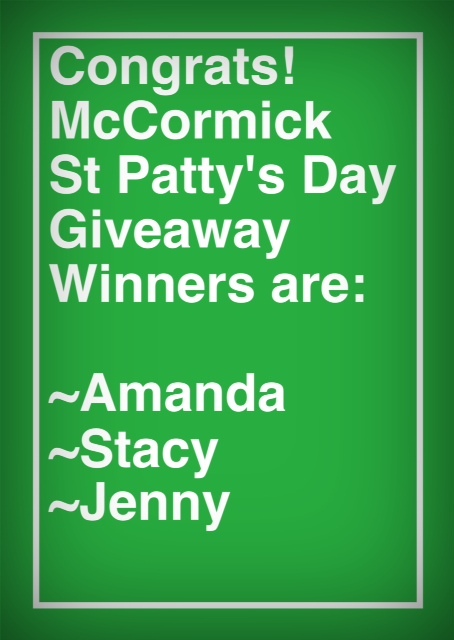 McCormick has agreed to give 3 of my lucky readers a fun gift set just in time for the holiday of luck!! This box if filled with lots of ingredients for the perfect St. Patrick’s Day treat! The giveaway is simple. Once you complete the following items, you will be entered to win. A winner will be announced on Monday the 12th and your prize will ship that afternoon! Ready for the rules? 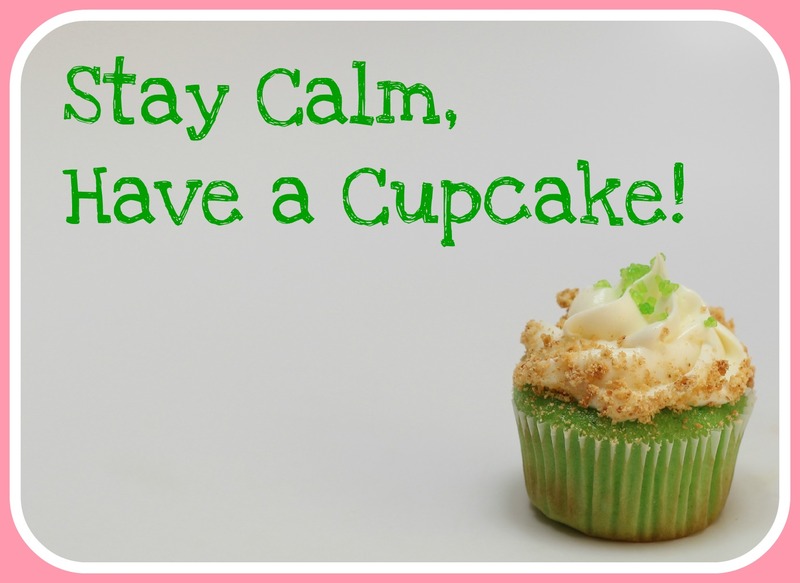 Go the McCormick Facebook Page and tell them Stay Calm Cupcake sent you! Follow me on Twitter and retweet about the contest. 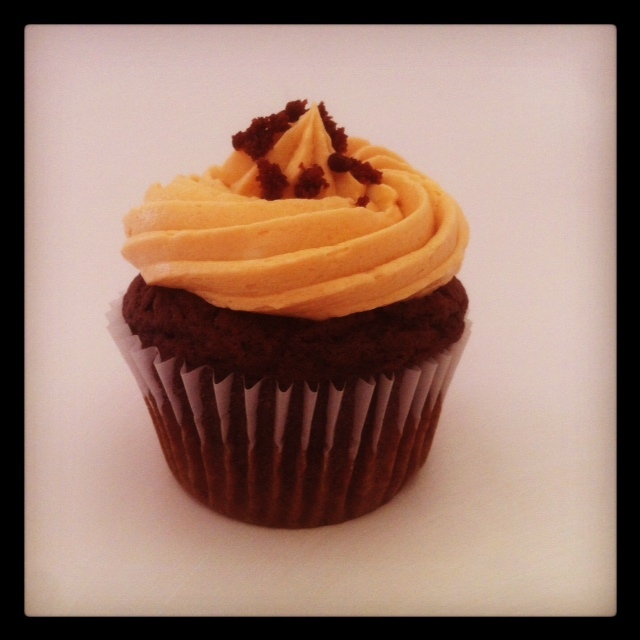 Use the tweet “@StayCalmCupcake is giving away a McCormick Halloween Kit! 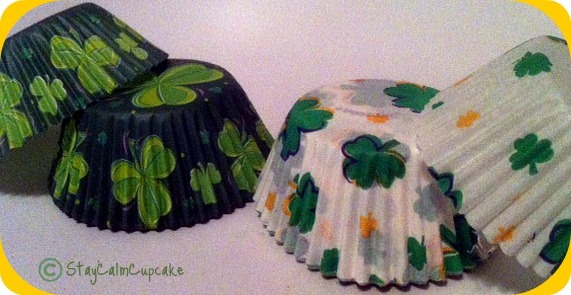 Next week I will be featuring lots of yummy St. Patrick’s Day treats. 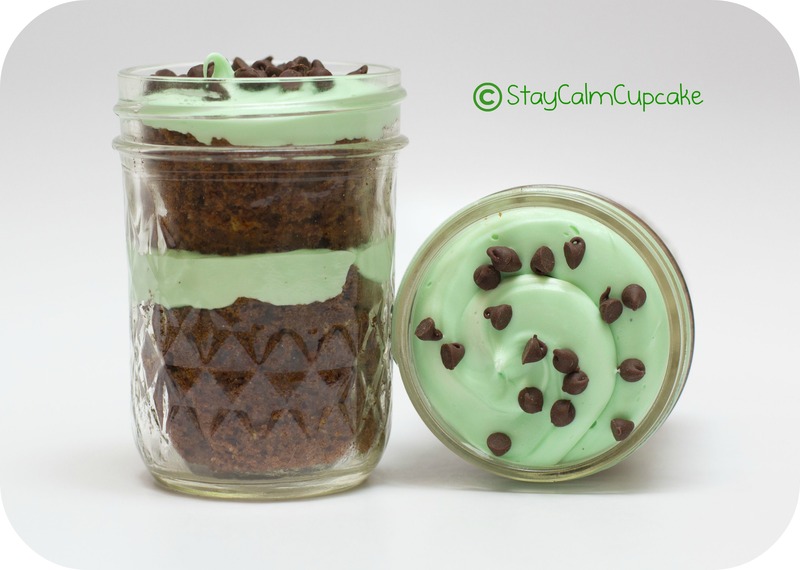 So make sure you stop back by and get some inspirtaion for making yummy green treats of your own! Have a great weekend. Stay Sweet! What makes a pumpkin smile? Candy Corn of course!! 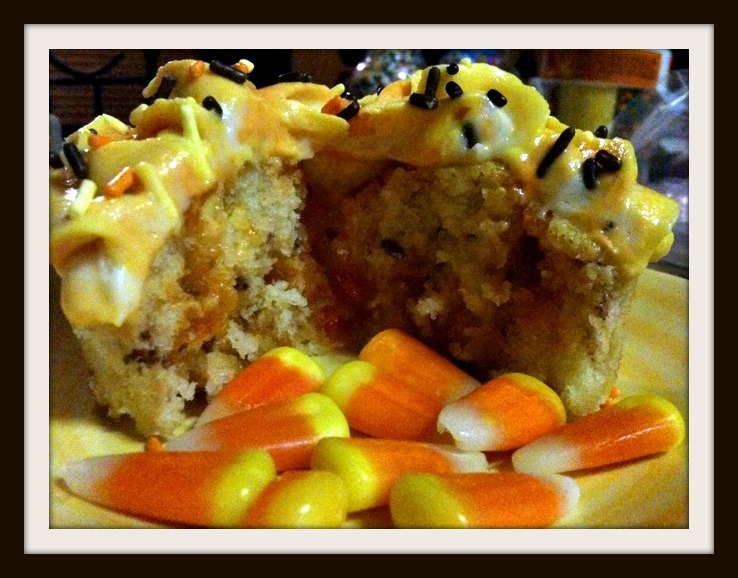 As promised, today is all about candy corn cupcakes!! If you haven’t already, make sure you enter to win an awesome McCormick Halloween Treat Basket. Find out more details on the prize and how to enter here. 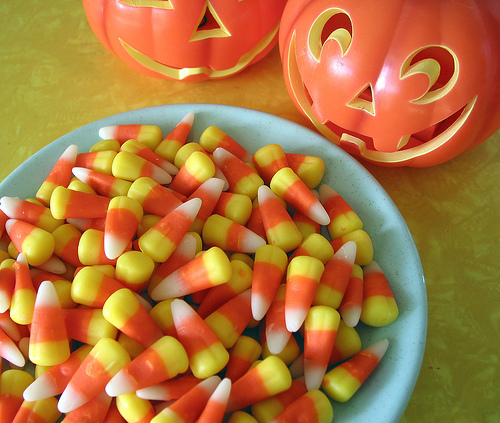 Candy Corns have been, and always will be, the quintessential fall candy. I’m not sure what I like best about them….the bright fall colors, the taste of pure sugar, or the fact that they are perfect for decorating cupcakes with! Today’s Recipe and Decorating ideas are super easy and perfect to do with your little ones at home. 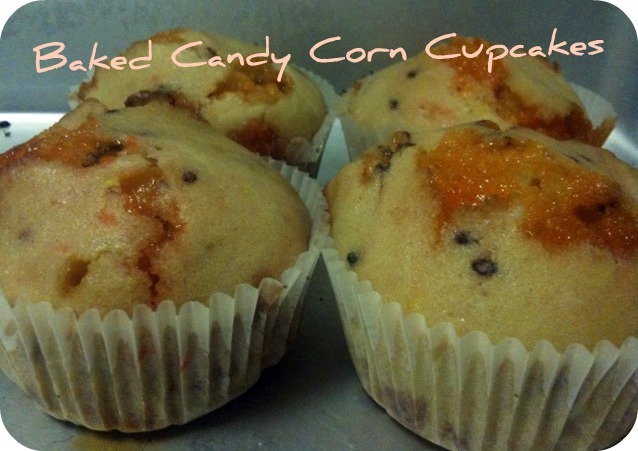 I love this recipe because you bake candy corn right into the cupcake! They come out gooey and delicious – not to mention they look so festive! For this cupcake, I use a traditional vanilla cake recipe. If you want to make this even easier, you can use a box mix. Ok, now that we have all of our necessary ingredients, let’s get started. 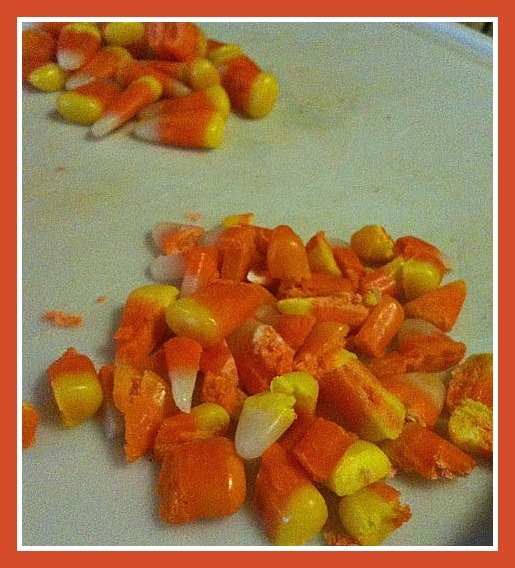 Start by chopping up 1 cup of candy corn. I did this with a knife, but a food processor would work well too. You want medium size chunks. Measure out 3 tbs of fall sprinkles. Pour sprinkles into the cake batter. Pour cupcake batter into your cupcake liners and bake for 15-18 minutes or until the tops of your cupcakes are slightly brown. Let cool for 20-30 minutes. Candy Corns Baked Right In the Batter! Let’s makes some frosting while we are waiting for our cupcakes to cool. Take the vanilla frosting, whether it is canned or homemade, and divide it into 3 bowls. In one bowl use 3 drops of McCormick’s yellow food coloring and one drop of McCormick’s red food coloring. Combine well until you get the perfect color orange. Using a spatula or spoon, spoon some yellow frosting into the left side of your piping bag. Fill the other side with orange frosting, and top with the remaining white frosting. 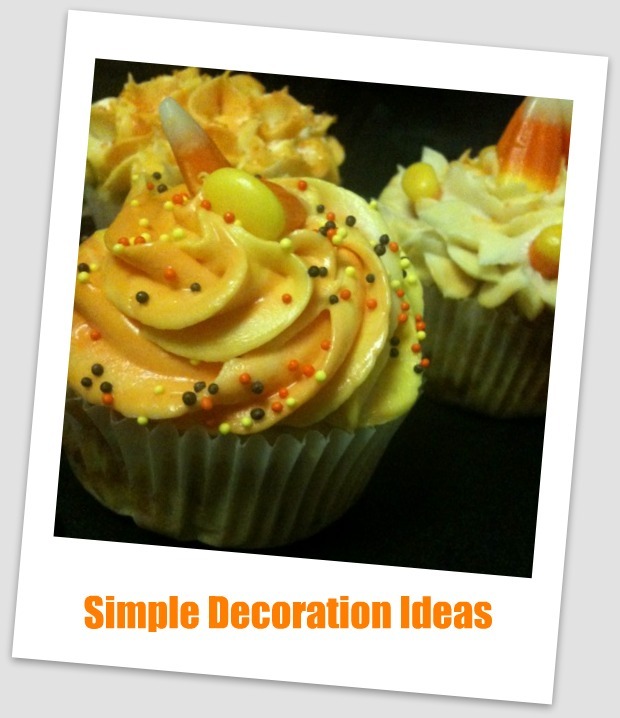 Swirl the frosting onto your cupcake and decorate with candy corn! 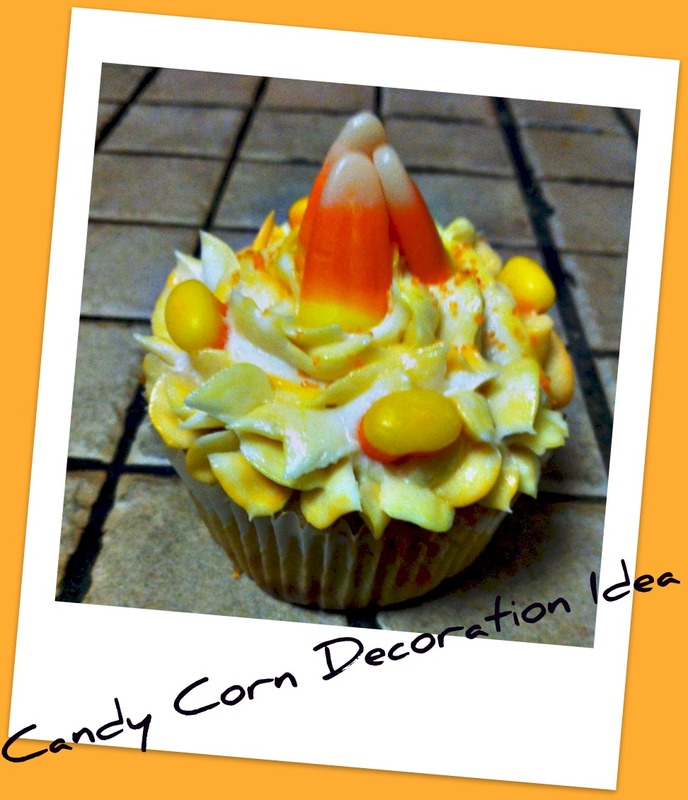 Be creative with your candy corn decorations – possibilities are endless! Hope you and family enjoy this fun fall recipe. Let me know how your candy corn cupcakes turn out!